Jason Aldean with a perfect performance. 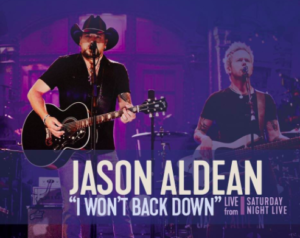 ThisJason Aldean was on stage when tragedy struck in Las Vegas a few weeks ago. People haven’t forgotten what happened that night. The videos are online. I just can’t imagine enjoying something you love, country music, and having something like that happen. It obviously affected Jason, but he seems to have had some time to think about it. And after that he went on Saturday Night Live to play a song. And the results were just about perfect for addressing the situation and moving forward. Sadly, we also lost Tom Petty earlier this year. Petty was one of the greatest rockstars of multiple generations. He started in the 1970s with dreams of playing great music. He had a few tough roads in the early days trying to find his style and his place in rock and roll. He found it, but then he always seemed to have more struggles. Especially with his record label. Multiple times. And Petty always seemed to have a little chip on his shoulder. He knew that some people wanted to bring him down, but he never let them. And I gotta think that’s where this song came from. This one came out in 1989. It was technically on a Tom Petty solo record, but some of his bandmates were still on it. Talk about a great choice from Jason to perform that night. Honoring a great music legend and letting the world know that it’s important to stand your ground and never back down.